Villa UJV 355, which is also referred to as villa Milonga, is a 4 bedroom, 4 bathroom villa set on a peaceful hillside above Marigot Bay, St Barts. UJV 355 is an elegantly furnished villa featuring multilevel decks and gorgeous panoramic views over Marigot and Grand Cul de Sac Bay. The dramatic views can be enjoyed throughout Villa UJV 355's interior areas as well as the pool terrace. The bedrooms, all with air-conditioning, have king beds, private bathrooms with showers, and dramatic views over the pool terrace to the sea. The large, open living and dining space, which is tastefully decorated with a mix of antiques and art, overlooks the pool and the view. Villa UJV 355 has a large, open kitchen that is fully-equipped and has plenty of counter space for food preparation. UJV 355 offers an authentic outdoor Argentinean BBQ as well. 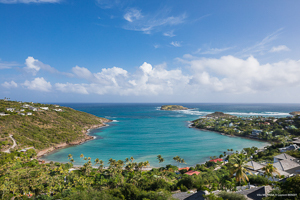 A wonderful St Barts experience awaits you at villa UJV 355.